A product of the Chicoutimi Sagueneens in the Q, Marc Bureau went undrafted, with the Trois-Riviere native signing as a free agent with Calgary in the late-1980s. 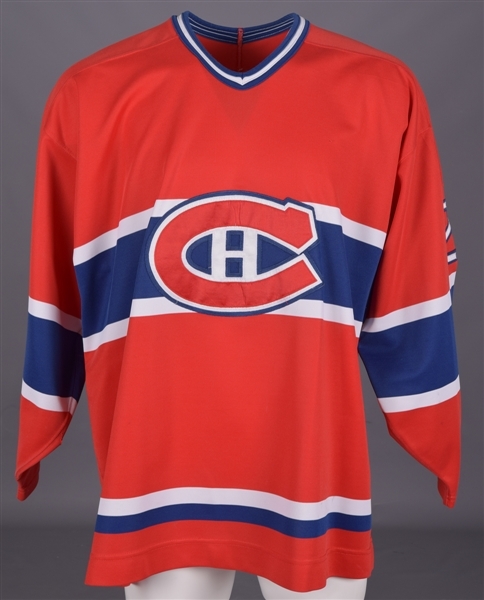 We have a Montreal Canadiens jersey worn by Bureau in the mid-1990s, circa 1995-96 or 1996-97. A faded Maska Ultrafil label and size “56” fly tag remain affixed to the collar, with embroidered CCM and NHL crests over the reverse bottom hem. Styled with the most famous team crest in hockey, “28” appears over the sleeves and verso in white-over-blue tackle twill, with “Bureau” across the affixed nameplate in single white twill. Board burns with small resulting holes are present over each sleeve, with additional burns over the right shoulder. There are also a few wrinkles to the team crest, with a small fabric pull just above. 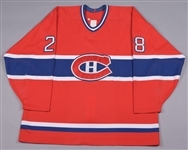 A team LOA will be included, signed on behalf of the Canadiens by Rejean Houle.